I watched two barges pass in the center channel and thought of an old arcade cabinet, the joystick a bit loose, paint faded and peeling along the edges, graphics nothing more than dots and imagination. Quarters line the screen, ready to feed into slots after every game over, to bring that tiny pixel frog glowing back to life to hop across a pixel highway filled with pixel trucks. Every movement, every spinning motor, feeds into calculations, possibilities, routes through the chaos of barges and tugs. The current pushes underneath it all, swirling around bends, sliding under parked barges, adding another layer of uncertainty. On the radio, boats call to each other, filling the static with bits of information. Southbound. Northbound. Pass on the right. I’m just under the bridge. Come around on the 2. Bring her down. Bring her down. Jargon and short phrases, names of places, accents covered in static. See you on the two. Heading down to New Orleans. The good water. Where do you want me. Take ya on the one. Pull her up. Pull her up. Fifteen barge rafts a thousand feet long, small tugs scooting from bank to bank, parked barges hanging in the water–the river feels like a giant game of Frogger. I slipped behind an old, rusted wreck, a pocket of sanity, to rest my mind for a moment, to hide from the information rushing at me. “Just a game,” I told myself. 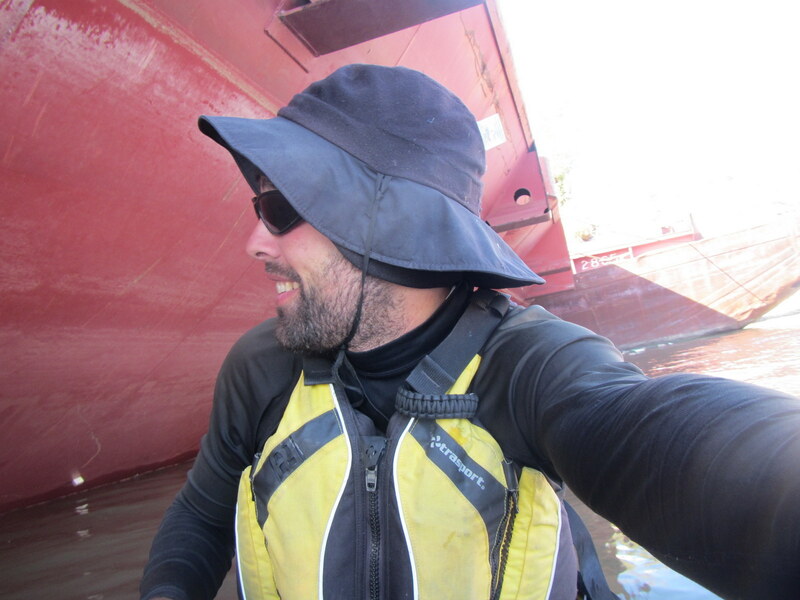 The river looked clear and I edged out toward the corner of two parked barges to check a blind spot, expecting a pocket of stillness under the giant wedges of steel. But the water wasn’t still at all. I felt the boat slip sideways in the current and my stomach twisted in horrible, frozen moment. I was about to die, about to slide under a barge. My shoulder slammed into the metal wall and I shoved against it with all my desperate strength, fighting it off, trying to push a bit of the boat around the corner, trying to keep it from catching an edge and flipping underneath me, trying to push it beyond my tightening world. The sky went dark with rusted steel. Then I popped into the light, past the corner, spinning into the river as the barge bit down on the Looksha’s tail and spit us out. When I breathed again, I laughed and thought of how stupid I was, how all death needs is a moment, how you can’t always slide another quarter into the machine to bring that pixel frog back to life. Posted in Angle to Key WestTagged AKW November, Angle to Key West, barges, being stupid, current, death, frogger, mississippi riverBookmark the permalink. H.S….reality can be breathless in many ways. Whoa, Cowboy! The things you don’t tell me…….. Beautifully written, but now my stomach hurts! Be careful out there!